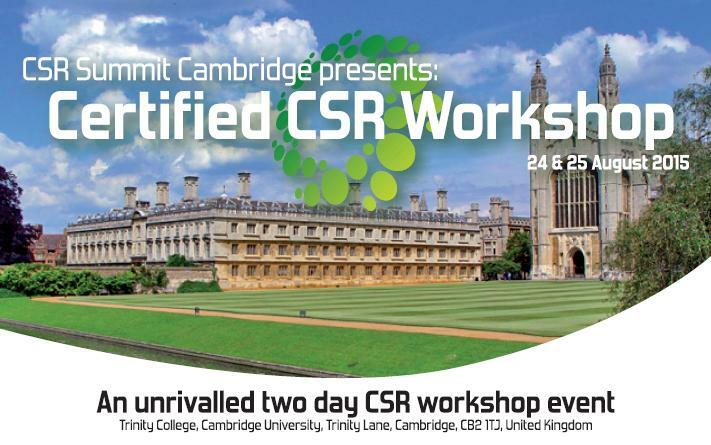 The CSR certified training event is organised by EMG-CSR and hosted in Trinity Hall, one of the most beautiful and oldest colleges of the renown Cambridge University, UK. The certified training events are held 4 times per year, every 3 motnhs. The CSR certified training includes hands-on, innovative and thought-provoking training courses on corporate social responsibility and sustainability that will help you and your organisation build expertise in CSR and Sustainability, and achieve your CSR objectives. The CSR Summit Cambridge is a leading platform for business leaders and experts to discuss and learn more about corporate social responsibility trends and strategies in the EMEA (Europe, the Middle East, Africa) region, as well as to look forward to a more sustainable future and viable strategies to be at the forefront of these developments. Experts from various parts of the world will facilitate fundamental and advanced concepts in CSR and sustainability. The summit training courses are specifically designed for a global audience of business leaders, CSR, sustainability and compliance managers, strategic planners, members of the NGO community, policy makers, investors, donor organizations, civil society groups and others interested in gaining valuable new insight into the latest trends, inspiring best practices, fundamental and advanced concepts, and emerging issues in the field of CSR and Sustainability. The training courses also offer practical tools, advice, and the opportunity to build professional networks. Topics include Global Trends and Drivers, Sustainability Reporting, CSR fundamentals, Measuring Impact and Performance, Strategy & Leadership in CSR, Sustainability and Innovation, and much more. All CSR training courses are certified and built around an engaging methodology of hands-on and involved learning with a focus on value integration. Through lectures, case studies, group-work and challenging problem solving exercises participants integrate theory and practice that can be easily applied at a strategic and operational level of business. The CSR Summit Training Courses are also an excellent opportunity to network with leaders and experts in the field of CSR and Sustainability, and to build long-lasting partnerships. Professionals will leave the CSR Summit Training Courses with advanced knowledge, inspiration, and comprehensive skills for bringing added value and authenticity to their organizations in order to ensure positive long-term impact and visibility. For more information plase contact us directly.